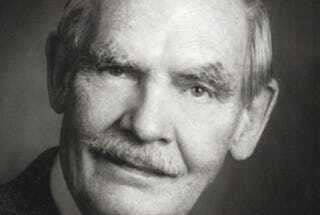 Science fiction author Frederik Pohl passed away yesterday at the age of 93. In the 1960s, Pohl was the editor of Galaxy and If magazines and won numerous awards for his fiction over the years. He was inducted into the Science Fiction Hall of Fame in 1998. I didn't know Pohl personally but I had the honor of exchanging emails with him last year where we talked about time capsules, politics, and futurist predictions as a form of cold reading. Back in April of 2012 I went to a Scientologist sci-fi writing and illustration awards ceremony in Los Angeles because they were putting some 1987 time capsule predictions on display. One of the predictions was from Pohl, who I contacted through email to ask about his letter to the future. There were over a dozen letters in the time capsule from people like Orson Scott Card and Isaac Asimov. But it was Pohl's letter that really caught my eye because it hinted at a skepticism surrounding the entire practice of prediction — in particular, a reference to the work of cold readers and other charlatans who would have you believe that they can see into the future with certainty. My editors at the former home of the Paleofuture blog weren't comfortable with publishing Pohl's responses to my questions in the lead-up to the 2012 election (Pohl was not a fan of the GOP) and so my brief email interview never saw the light of day. But with Mr. Pohl's passing it seems like a good time to pull out his letter and the resulting exchange we had. You'll find his 1987 letter to the future along with our email exchange below. In my day there were professional entertainers, and fake psychics, who specialized in telling total strangers all sorts of intimate details about themselves. The process was called *cold reading*. I’ve never done it before, but I think I can do it for you. I think I can tell you quite accurately what your lives are like as you open this time capsule. For example, you live in a world at peace. Something like the World Court, as an arm of something like the United Nations, resolves international disputes, and has the power to enforce its decisions. For that reason, you live in a world almost without weaponry; and, because you therefore do not have to bear the crippling financial burden of paying for military establishments and hardware, all of you enjoy an average standard of living about equal to a contemporary millionaire’s. Your health is generally superb. Your life expectancy is not much less than a century. The most unpleasant and debilitating jobs (heavy industry, mining, large-scale farming) are given over to machines; most work performed by human beings is in some sense creative. The exploration of space is picking up speed, both by manned colonization and robot probes, and by vast orbiting telescopes and other instruments. Deforestation, desertification and the destruction of arable land has been halted and reversed. Pollution is controlled, and all the winds and the waters of the Earth are sweet again. This is a very short description of your life, but it could be made even shorter. A single word can describe it: it is very close to what every previous age of mankind would call *Utopia*. It isn’t because I’ve made a probabilistic assessment of present-day trends. Quite the contrary. All the evidence of what is going on in the world today leads to the conclusion that none of these things are going to happen, because our country, the richest and most powerful nation in the history of the world (and, I have always thought, the best) is bankrupting itself to recruit and train terrorists in Latin America, give arms to terrorists all over the world, develop and deploy fleets, armies and weapons systems which have no purpose except to pound any country which disagrees with us into submission. Since, unfortunately for us, the people who disagree with us have terrorists, fleets, armies and weapons systems of their own, the most plausible future scenario is all-out nuclear war. It is therefore clear that to make the predictions above is to bet recklessly against the odds. It’s still a good bet, though. In fact, I don’t see how I can lose it. Anyone opening the capsule to read these lines will have to agree that my low-probability predictions pretty well describe the actual turn of events... because if the high-probability ones of mass destruction and species suicide should prevail no one is likely to be around to read them. Do you remember writing the letter? Were you aware that it was going to be opened last night? Is this the first you're hearing about it? Making the deposit of that letter had slipped my mind, but you've reminded me of it. I didn't take it very seriously. And your email was the first news of it, or reference to it in any form, in some twenty-odd years. Would you characterize your letter as generally optimistic or pessimistic? Your mention of cold reading is quite interesting; were you hedging your bets (as cold readers do) by laying out the two possible extremes? You're right, I was hedging my bets—-as well as spelling out a kind of moral lesson for all the participants who would hear what I had to say. Actually I did think the world would have wound up either as a planet of peace and reason, or, if that didn't happen, a post-nuke wreck. I might have been right, too, except for the Supreme Court arrogating to itself the decision as to who would become President in 2000. This led us to GW Bush's time of a couple of smaller wars going at once instead of the other alternatives of either peace or one big one. How do you feel about the prospects for the world today? Are you generally optimistic or pessimistic for our future? Do you have a prediction for the world of 25 years from today? At present I'm tentatively hopeful about the future. The biggest worries now are environmental. If the Republicans win in November their policy of ignoring the environmental elephant in the living room until there are real catastrophes and a permanently damaged planet. If the GOP—-which I argue should stand for "Greedy Old Party"—-loses, there is some hope for ultimately arriving at the Utopian world I was dreaming of. I tried calling the phone number on the letter but no one picked up. Is that still your phone number and address? That phone number was almost right except that the phone company changed [the area code] some years ago. P.S. You are aware, I assume, that that time letter was done under the auspices of the Scientologists, which is either immaterial or very much not, depending on what you thought of L. Ron Hubbard.